The mood music for this Synod is also interesting. There’s been a bit of a charm offensive on behalf of the Reform and Renewal programme (hereinafter referred to as ‘RnR’). Some would say this is simply to help new people get their heads around what is actually a huge change of gear for the dear old C of E. Others, more hard-bitten and suspicious, will see it as the ‘platform party’ of Archbishops’ Council and others getting their retaliation in first, anticipating some sharp criticism. It is just possible that some old hands have used the five months since the July Synod to get into the detail of the proposed changes to funding, ministerial training, etc etc. Questions tonight may reflect that unease. The only bit of RnR that consistently gets a good press is the ‘Simplification’ strand: because we are all on favour of making church life simpler – for churchwardens, clergy, PCCs and Synods. However, the devil may be in the simple details and we probably should avoid any simplistic meerkat responses (“Simples!”). After all, Synod’s job is to scrutinise on behalf of the parishes and dioceses. The induction day today is getting a presentation all of its own on RnR from John Spence. None of which anyone would argue against. But as I said, the RnR devil is in the RnR detail. Today is an induction day: largely aimed at new members, but quite a few old lags will be there too, including yours truly. In the past I’ve found it helpful to meet some new people before we get into agendas and timetables. And I suspect nervous Synod newbies find the immensely helpful briefings from the Synod staff will calm nerves and help them feel less at sea than would otherwise be the case. Wonderfully, the Grauniad’s/Observer’s new-ish Religion Correspondent, Harriet Sherwood, has done a Synod preview piece! Such things have all but disappeared from serious newspapers, so it’s good to see a reasonably dispassionate look at what’s ahead. She has interviewed some of the usual suspects, but it’s none the worse for that and will inform non-Churchy Grauniad/Observer readers, rather than upset them or merely reinforce their prejudices. It’s well worth a read, here. The presence of the Queen and Prince Philip means that the first day of Synod will feel overshadowed by ceremony. Which is a pity, as even allowing for the fact that we have lots of new members (see below) and it’s a short time, there is some serious business to be done. The royal involvement is important (though irritating to Synod’s small soft republican members) for two reasons. 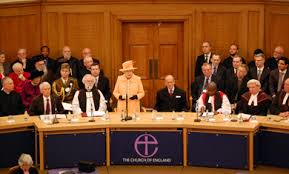 It is one of the bits of glue that hold together the whole Establishment of the C of E. For all the tossing about of words (“The Queen is ‘Head of the Church'”. Well, in temporal sense, yes, but Jesus probably trumps her as the head figure, really), the fact that she starts the new Synod off by attending worship with us, and then gives us an address means that the schoolboy atheists cannot say ‘We are a secular country’. Tuesday morning means we most definitely are not. And then the content of her address is likely to be remarkable. Five years ago she spoke most warmly and personally about the meaning of the Christian faith and it’s place in British life. As her astonishingly long reign has gone on, she has referred to her own faith increasingly in Christmas broadcasts. Her Synod address gives her an entirely legitimate platform to expand on that. We’ll listen with interest, I have no doubt. What we can’t tell is what these changes will do to the groupings on Synod. “Inclusive Church” ran a pretty focussed campaign to get people to stand, and (by circulating lists) telling like-minded people who to vote for. It felt more like a party (in the parliamentary/political) sense than we are used to, where the evangelicals, Catholics and others have their groupings, but have tended not to issue ‘party lists’. In their post-election statements, the various grouping have all more or less said they did very well. We shall see what that actually means when we got to some votes on key issues. Which won’t be this week – the agenda is interesting, but not full of ‘evangelical ‘inclusive’ or ‘Catholic’ issues. In my time (2005 to now)there’s been a huge change in how Synod tells the world about itself. And how Synod members talk to each other. Reading other people’s blogs is a decent way of getting some perspective. It’s in the nature of blogging for people to be rather stop-start about when they post anything. Penny Allen from Lichfield is returning for 2015-20, and has a track record of posting good matter-of-fact accounts of what’s been discussed and decided in ‘Penny at Synod’. Read her here. Charlotte Gale is a parish priest from Coventry, also returning, and ‘Charlotte at Synod’ describes her days at Synod in a cheerful and personable way, with a slight bias to things that would interest clergy. None the worse for that – find her here. Andrew Nunn, the Dean of Southwark is very readable and to the point. he also manages to keep on track with a dimension of prayer and spirituality about Synod, which we don’t all manage…. Read him here. Simon Taylor has been re-elected from Derby, so I guess he will be posting some stuff. He’s been thorough in posting his various submissions to Revision Committees, etc in the past, so… Read him here. Thinking Anglicans is a six-person team, none of whom is currently a member ( I think), but they offer superb and unparalleled links to Synod papers, reports and related matters from Parliament and the media. You might think it worth bookmarking them – find them here. A number of Bishops blog intermittently about Synod. Worth checking Pete Broadbent (Bishop of Willesden) here; and Nick Baines (Bishop of West Yorkshire and the Dales, a.k.a. Leeds)’s ‘Musings of a restless Bishop’ here. Twitter, of course, if a whole different thing. Some members tweet away all day during sessions: others are more episodic. Some have nothing to do with it! But a lot of non-members follow the ‘twitter stream’ from home or place of work, so it’s a very immediate way of keeping in touch. 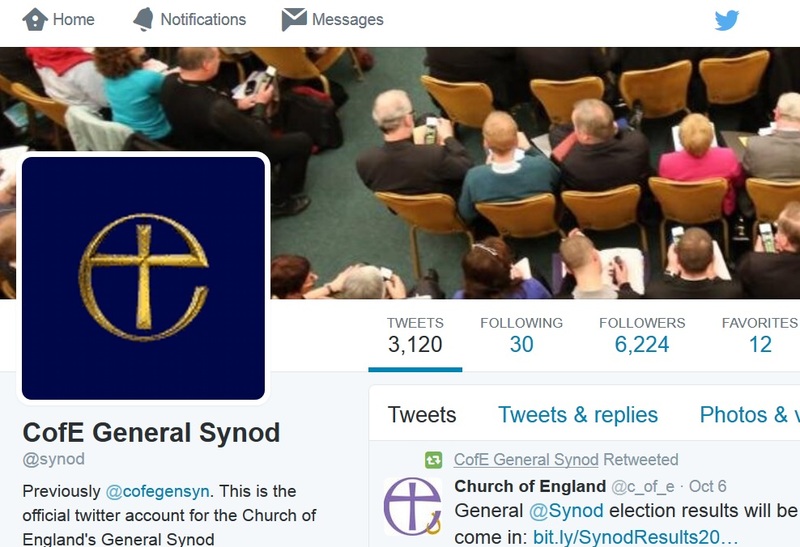 The ‘official’ account to follow is @Synod or just look for the hashtag #synod – though you need to be aware it is also used by synods of other churches from the Catholics to Lutherans if they happen to have a Synod running at the same time as we do!. An alternative, very unofficial one to follow is @GenSyn. People are a bit freer there. There is usually a TV monitor with a twitterfall in the tea room so members, even those without smartphones, can keep up. The Church House Comms team (they’re the ones sitting high up in the gallery looking worried…) do a fantastic job of handling the media during, before, and after Synod. They do put up real old-fashioned newspaper cuttings every day, but their Daily Digest (which you can get by email for free) links to all Press reports and some blogs (though sadly not this one!) on a wider basis. Probably essential reading for all Synod members – you can sign up here. As Arun Arora told the induction day: we are episcopally led, synodically governed, and clerically tweeted! The latest addition to the digital armoury is the General Synod App. 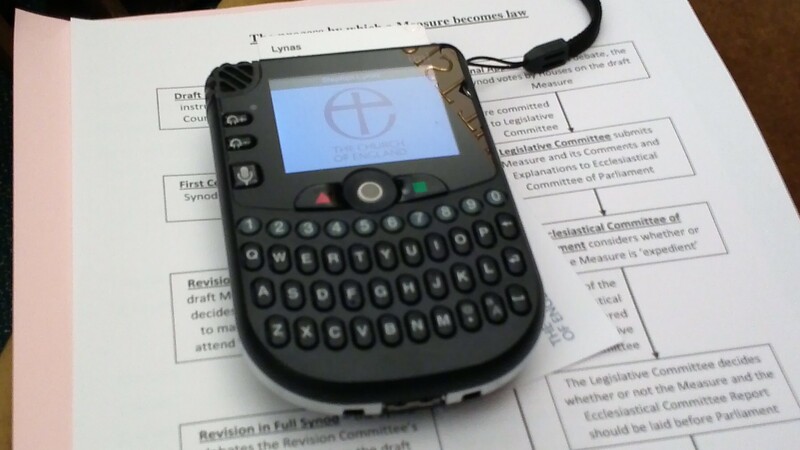 This enables people using Apple or Android devices to get all synod papers, and put in requests to speak, electronically. Already, 200 people have downloaded the Apple version. Sadly, bathwellschap uses a Microsoft Surface tablet, so I am excluded. But if you can use it, get it from the Apple Store or Google Play (whatever they may be). Ooh, and old lags like me will have to get used to the new voting machines: slightly more complex and therefore frightening than the old ones. I’ll post a brief update tonight, when all the new boys and girls have had their uniform checked, got their registration cards and met all the prefects and teachers. * We’ve only just begun: The Carpenters 1970 smash about setting out on the journey of a relationship. Yes, I know people say it is smoochy MOR rubbish. But what a voice she had! **Did you see what I did there? Think Karen Carpenter, last verse of the title song. And yes we’ve just begun. 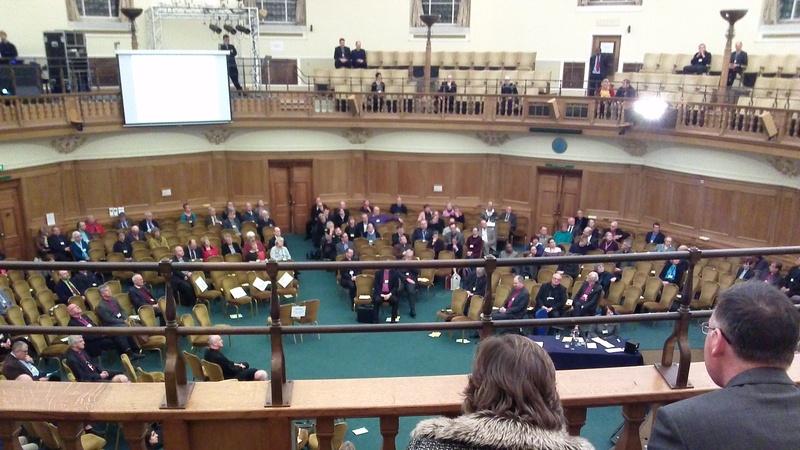 This entry was posted in 2015: Nov - London, General Synod and tagged Church of England, electronic voting machines, General Synod, Reform and Renewal, Why blog?. Bookmark the permalink. I am interested that you say: ““Inclusive Church” ran a pretty focussed campaign to get people to stand, and (by circulating lists) telling like-minded people who to vote for. It felt more like a party (in the parliamentary/political) sense than we are used to, where the evangelicals, Catholics and others have their groupings, but have tended not to issue ‘party lists’.” I have experience of both ends of the CofE spectrum: FiF and Reform, have very well-oiled political machinery doing exactly this and have done so for some time.